Cuomo Unveils New York City's First LGBT Memorial - Joe.My.God. 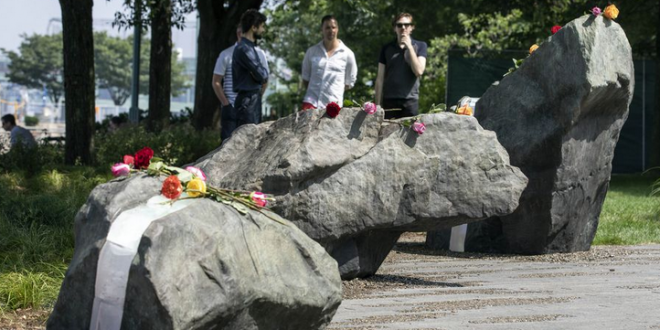 Located on the waterfront, roughly between West 12th Street and Bethune Street, the memorial comprises nine large boulders that sit in a circular pattern. Six of these boulders are bisected and then bonded together again with glass. The glass was also used for its refractive qualities—the rainbow is an icon in the LGBTQ community, and when the light hits the glass properly, it projects subtle, colorful patterns. The public space art initiative came from the LGBT Memorial Commission started by Cuomo after the tragic shooting in Orlando, Fla., on June 12, 2016, which left 50 people dead including the shooter, and another 53 people wounded. “As we recognize the sacrifice this community has had to endure throughout the course of history, we are reminded of our commitment to protecting and advancing the rights of the LGBT community until we live in a world free from hate once and for all,” said Cuomo. In December 2016 an AIDS memorial opened in the West Village and it is dedicated to all those affected, not just the LGBT community.